The interior of an Amtrak Pacific Parlour Car, a refurbished lounge. The Hi-Level was a type of bilevel intercity railroad passenger car used in the United States. The Budd Company designed it in the 1950s for the Atchison, Topeka and Santa Fe Railway ("Santa Fe") for use on the El Capitan, a coach-only streamliner which ran daily between Los Angeles and Chicago. The design was inspired by two recent developments in railroading: the dome car, employed in intercity routes in the Western United States, and bilevel commuter cars operating in the Chicago area. Budd built 73 Hi-Level cars between 1952 and 1964. Car types included coaches, dining cars, and lounge cars. Most passenger spaces were on the upper level, which featured a row of windows on both sides. Boarding was on the lower level; passengers climbed up a center stairwell to access the upper level. Vestibules on the upper level permitted passengers to walk between cars; some coaches had an additional stairwell at one end to allow access to single-level equipment. Santa Fe and Budd considered but never created a sleeping car. The first two prototype coaches entered service on the El Capitan in 1954 and were immediately successful. Budd built sufficient coaches, dining cars, and lounge cars to fully equip the El Capitan, with additional coaches seeing use on the San Francisco Chief. Amtrak inherited the entire fleet in 1971 and continued to use the equipment on its western routes. Tunnel clearances restricted their use in the Eastern United States. In 1979, the first Superliners, based on the Hi-Level concept although built by Pullman-Standard, entered service. Amtrak gradually retired most of its Hi-Levels in the 1990s as more Superliners became available. Five lounges, dubbed "Pacific Parlour Cars", provided first-class lounge service on the Coast Starlight until their retirement in 2018. The Santa Fe introduced the El Capitan in 1938. The train ran on the Santa Fe's main line between Chicago and Los Angeles. Unusually for streamliners of the period, the El Capitan carried coaches only, and had no sleeping cars. Passengers flocked to the new train, and the Santa Fe added cars to meet the demand. The train grew from five cars in 1938 to twelve in 1942. By the early 1950s fourteen was common. Only seven or eight of these would be passenger-carrying coaches; other cars included head-end cars, a baggage-dormitory for the crew, two dining cars, and a Big Dome lounge. Sometimes demand was high enough to justify running a second instance ("section") of the train on the same day. The Santa Fe sought a solution to increase the capacity of the train without lengthening it further. Two popular innovations by the Chicago, Burlington and Quincy Railroad (CB&Q) suggested a solution. First, in 1945, the CB&Q introduced the dome car, in which passengers rode on a second level high above the tracks, affording better views. Second, in 1950, it placed bilevel rail cars in commuter service in the Chicago area. Taken together, these innovations suggested a new possibility: a long-distance bilevel coach, with greater capacity than single-level cars, and the panoramic views of a dome. The Budd Company approached Santa Fe in 1952 with the proposal to build long-distance bilevel cars, building on the gallery commuter car concept. Santa Fe accepted the proposal, and took delivery of two prototype coaches in 1954. The cars went into regular service on the El Capitan. Following a positive customer response, the Santa Fe ordered 47 more cars: ten 68-seat "step down" coaches, twenty-five 72-seat coaches, six lounges, and six dining cars. These constituted five equipment sets ("consists"), sufficient for daily service on the El Capitan. The project cost $13 million. Trains editor David P. Morgan thought the equipment was "comfortable" and that it "[rode] well, even above 90 mph." S. Kip Farrington wrote that he was "definitely sold on the high level in every angle" and that it was "here to stay." A typical train comprised two step-down coaches, five standard coaches, a lounge, and a dining car. The Hi-Level cars continued in service after the Santa Fe combined the El Capitan and Super Chief in 1958. The Santa Fe also converted six single-level baggage cars to baggage-dormitories (Nos. 3477–3482), with a spoiler at one end to create a visual transition. The cars dated from the 1938 version of the El Capitan. Despite their success, the cars did not inspire a wave of imitators. By the late 1950s, private-sector passenger travel was in what turned out to be irreversible decline. Most railroads were cutting service; few ordered new equipment of any kind. An exception was the Chicago and North Western Railway (CNW). The CNW, like the Burlington, used bilevel coaches on its Chicago-area commuter routes. In 1958 it ordered thirteen intercity bilevel cars from Pullman-Standard: ten coaches, a parlor car, a coach-parlor, and a coach-lounge. Visually they resembled the CNW's existing commuter equipment; a noticeable difference from the Hi-Levels was the adoption of HEP instead of steam. The cars entered service on the Peninsula 400, a Chicago–Ishpeming, Michigan day train, on October 26, 1958. The CNW would be the only other railroad to introduce bilevel equipment on intercity runs. By the 1960s, the Santa Fe encountered capacity problems on the San Francisco Chief, which ran between Chicago and San Francisco. Unlike the El Capitan, the Chief carried a mix of sleeping cars and coaches. To augment capacity, the Santa Fe ordered an additional 24 coaches in 1963–1964: 12 step-down and 12 standard. This was the final major order for new long-distance passenger equipment before the coming of Amtrak. Each San Francisco Chief carried four Hi-Level coaches, displacing six single-level coaches. Throughout the 1960s passenger ridership declined on American railroads while losses mounted. In 1971 the United States federal government created Amtrak, a subsidized for-profit corporation, to take over intercity services and reverse the decline. The Santa Fe, after some hesitation, participated. Amtrak took over the Santa Fe's remaining trains on May 1, 1971. It acquired the entire Hi-Level fleet and continued to operate them. The primary assignment continued to be the combined Super Chief/El Capitan, known as the Southwest Limited from 1974–1984 and the Southwest Chief thereafter. The Chicago–Houston Texas Chief, another ex-Santa Fe train, also carried Hi-Level coaches. Amtrak was impressed with the Hi-Levels and used them as the basis for the design of the bilevel Superliner family of railcars. The first of 284 Superliner I cars began arriving from Pullman-Standard in 1978. As the Superliners went into service, Hi-Levels could be found on more of Amtrak's trains throughout the Western United States. Hi-Level coaches appeared on the San Francisco–Chicago San Francisco Zephyr, Chicago–San Antonio, Texas–Los Angeles Eagle, and the Chicago-Seattle, Washington/Portland, Oregon Empire Builder. Dining cars displaced from the Southwest Limited filled in on the Ogden, Utah–Los Angeles Desert Wind. Tunnel clearances around New York City and elsewhere prevented their use on the Northeast Corridor. The Superliner I order did not include any "step down" coaches, so Hi-Level coaches continued to fulfill this function on Superliner-equipped trains. In the 1980s, Amtrak rebuilt many of these coaches as dormitory-coaches, with half of the car given over to crew space. Amtrak retired all six single-level baggage-dormitory cars by 1981 in lieu of converting them to HEP. By 1990 the Amtrak fleet stood at 69 cars: 36 dormitory-coaches, 21 coaches, 6 diner-lounges rebuilt from dining cars, and the 6 lounge cars, which Amtrak marketed as "See-Level Lounges." The arrival of 195 Superliner II cars from Bombardier Transportation in 1993–1995 permitted the retirement of most of the remaining Hi-Level cars. The Chicago–Toronto International used a mix of Superliners and Hi-Levels from 1995–2000. Hi-Levels remained in service on the Oklahoma City–Dallas Heartland Flyer into the 2000s. The majority of the Hi-Level fleet was retired at the beginning of 2003. The private equity fund Corridor Capital owns most of the fleet, and has proposed employing them for various passenger projects within the United States. The last major Hi-Level assignment on Amtrak was the Los Angeles–Seattle Coast Starlight. In the late 1990s Amtrak refurbished five of the six lounges for use as sleeping car passenger-only lounges, branded as the "Pacific Parlour Car." Amtrak offered separate food and beverage service in the upper level and installed a movie theater in the lower level. The railway writer and historian Karl Zimmermann called them "the greatest treat for sleeping car passengers on Amtrak." By the late 2010s Amtrak was manufacturing new parts for the Hi-Levels at Beech Grove, or in some cases retrofitting the Hi-Levels to use Superliner parts. Amtrak retired the cars after their last run on February 4, 2018, citing safety concerns and rising maintenance costs. They were the last Hi-Levels in regular service, and among the few remaining Heritage Fleet cars. The Steam Railroading Institute, a heritage railroad based in Owosso, Michigan, acquired several for use in excursion service. The Hi-Levels stood 15 1⁄2 feet (4.7 m) high, 2 feet (0.61 m) taller than most conventional equipment. Seating occupied the entire upper level, with restrooms, baggage, and other non-revenue areas on the lower level. In most cars, vestibules connected the upper levels only. A central staircase linked the two levels. Hi-Levels featured a row of windows across the upper level; on the prototype coaches, this row slanted inwards. The two-level design offered several advantages over conventional single-level equipment. Budd and the Santa Fe expected the upper level, located 8 feet 7 inches (2.62 m) above the rails, to provide a smoother, quieter ride for passengers. With the lower level free of passengers, designers could provide larger restrooms and baggage areas. Finally, the lower level contained all the electrical equipment, away from the passengers, and with easy access for maintenance. Budd used stainless steel in the construction, with fluted sides. The cars cost $275,000 apiece. Budd built the Hi-Levels with steam heating, the standard method for ensuring passenger comfort in the 1950s. For air conditioning and other electrical needs, it chose to employ independent diesel generators in each car. Coaches required a single 40-kilowatt (54 hp) generator; the massive dining car required two such generators to support the kitchen appliances. In the lounge car a larger 60-kilowatt (80 hp) generator was employed. Beginning in the mid-1970s, Amtrak adopted head-end power (HEP) for new orders. HEP and steam are incompatible, so Amtrak had the Hi-Levels converted to HEP to permit their use with new cars. Santa Fe handled the conversion of the Hi-Levels in its Topeka, Kansas, shops. Of the 73 Hi-Levels, all but three underwent the conversion. The 61 coaches could carry either 68 or 72 passengers, half again more than the 44 of comparable single-level long-distance coaches. This increased capacity permitted the Santa Fe to run the El Capitan with fewer cars, while increasing the total number of passengers carried. The 68-seat coaches featured "step down" stairs at one end to permit access to standard-height equipment; that space was given over to four additional seats on the 72-seat coaches. The prototypes also featured step-down stairs, but carried one fewer passenger. The passenger windows were 21 inches (53 cm) high. The seat pitch was 50 inches (130 cm). 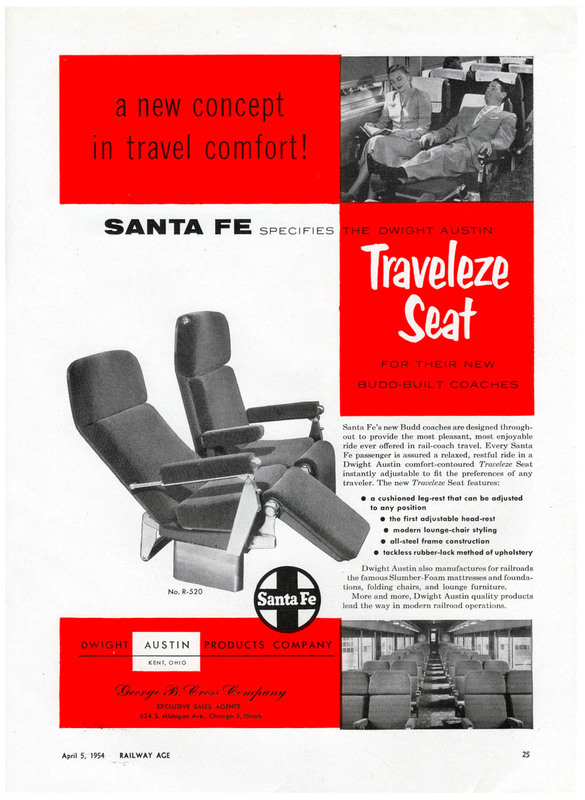 The Dwight Austin-manufactured "Traveleze" seats reclined, and included both head and leg rests. Hand luggage could be stored in racks above the coach seats, or in large storage racks on the lower level. In the prototypes the upper level had no restrooms; in response to passenger feedback, Budd added a restroom to the upper level in the production models. The prototypes also included a "step up" from the aisle to the coach seats; in the production cars, the seats rested flush with the aisle. Each coach weighed 80 short tons (73 t). The lounge cars were similar to the full-length Big Dome lounges which had entered service with the Santa Fe in 1954. The most obvious difference was the absence of a forward-looking view on the Hi-Level cars. Each of the six lounges could seat 60 people on the upper level. The seating was a mixture of single seats and two- and four-top tables. Nicknames for these cars included "Top of the Cap" and "Sky Lounges". A glass top across two-thirds of the car distinguished it from the rest of the Hi-Levels. The lower level featured the "Kachina Coffee Shop" and a lounge area with seating for 26. Passengers on the lower level could look out through large, 56-inch (140 cm) windows. The lounge cars weighed 83 short tons (75 t). Under Santa Fe operation there were attendants on both levels, and a newsstand on the upper level. Six dining cars were built. Each dining car seated 80, all on the upper level, compared to 36 in a single-level diner, enabling each car to do the work of two single-level dining cars. The lower level housed the kitchen, including ovens, hot plates, a refrigerator, and a dishwasher. Dumbwaiters carried food to the upper level. A diesel generator supplied power to the appliances. The dining cars, the largest single-unit dining cars ever built, weighed 97 short tons (88 t) and rode on six-wheel trucks. As Superliner dining cars arrived in the 1980s, Amtrak rebuilt these cars as diner-lounges, incorporating booths and lounge seating. Santa Fe considered equipping the Super Chief with Hi-Level sleeping cars, and Budd drafted a design for such a car in 1957. In this design there was an aisle on the lower level only, and set against one side instead of centerline. The lower level also contained six single bedrooms and a toilet. The upper level would have eight two-person "Vista Bedrooms" which spanned the width of the car. Access to these rooms would be from four sets of stairs from the lower level aside. Each Vista Bedroom would contain an individual toilet and two beds: one stacked above the bed in the single bedroom beneath, and one lengthwise over the aisle. Nothing came of this proposal. 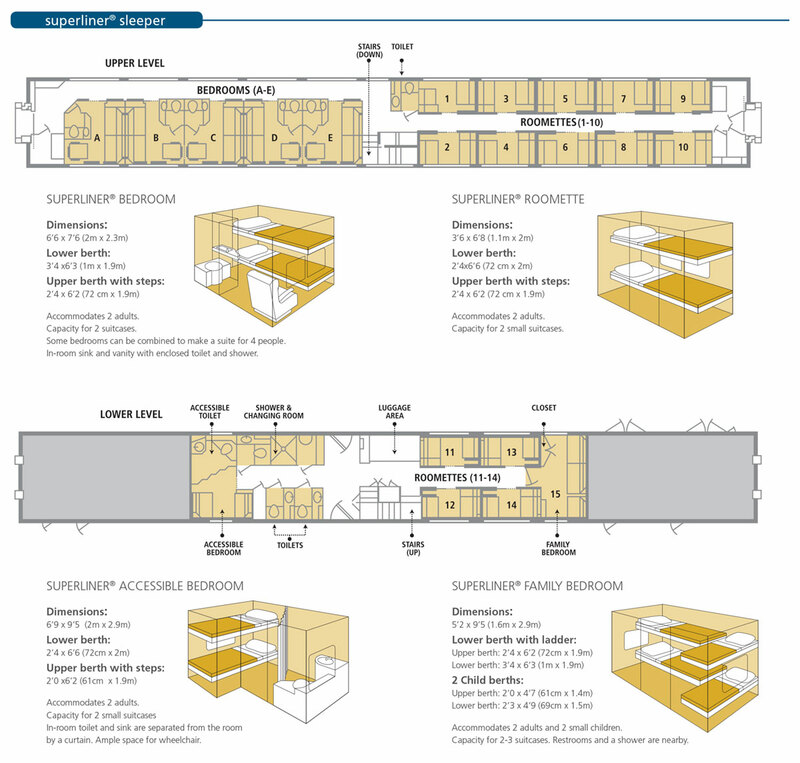 Pullman-Standard adopted a more traditional design for Amtrak's Superliner I in the 1970s: five bedrooms and ten roomettes on the upper level, two bedrooms and four roomettes on the lower level. ^ "Developer working to move AL passenger train project forward". WSFA. July 16, 2016. Retrieved March 15, 2018. ^ "Coast Starlight Parlour Car Removed" (Press release). Amtrak. Retrieved February 11, 2018. ^ Durr, Matt (March 18, 2019). "North Pole Express offering adults only cars for 2019 trips". MLive.com. Retrieved March 21, 2019. ^ "Hi-Level Car to Be Tested by Santa Fe". Chicago Tribune. July 18, 1954. p. 40. Archived from the original on February 11, 2018. Retrieved February 11, 2018 – via Newspapers.com. ^ "Beech Grove HEP Conversion Program Results In Like-New Car For Passengers". Amtrak NEWS. 7 (7): 8. August 1980. Archived from the original on November 18, 2015. ^ "Santa Fe Specifies the Dwight Austin Traveleze Seat". Railway Age. April 5, 1954. Archived from the original on September 9, 2015. Retrieved January 21, 2018. ^ "superliner sleeper". Amtrak Vacations. Archived from the original on September 6, 2017. Retrieved February 11, 2018. Abbey, Wallace W. (2016). "Short hop on El Capitan". In McGonigal, Robert S. (ed.). Great Trains West. Waukesha, Wisconsin: Kalmbach Publishing. pp. 60–65. ISBN 978-1-62700-435-0. Amtrak (August 1990). Amtrak's Passenger Trains (PDF). Dorin, Patrick C. (2005). The Super Chief and the El Capitan. Forest, Virginia: TLC Publishing. ISBN 978-0-9766201-9-8. Dubin, Arthur D. (1974). More classic trains. Milwaukee, Wisconsin: Kalmbach Books. OCLC 643578087. Farrington, S. Kip, Jr. (1958). Railroads of the Hour. Coward-McCann. OCLC 1226241. Flick, Michael W.; Kogan, Dennis (1999). "Santa Fe's Hi-Level Passenger Cars". Warbonnet. 5 (3). ISSN 0273-7426. Frailey, Fred W. (2010) . Twilight of the Great Trains (2nd ed.). Bloomington, Indiana: Indiana University Press. ISBN 978-0-253-35477-8. Griswold, Wesley S. (January 1957). "Riding the Santa Fe's Split-Level Train". Popular Science: 136–139, 240–241. ISSN 0161-7370. Ingles, J. David (October 1984). "Arrivals & Departures". Trains. 44 (12): 18. ISSN 0041-0934. Johnston, Bob (August 2017). "There's Beech Grove". Trains. 77 (8): 22–23. ISSN 0041-0934. McCommons, James (2009). Waiting on a Train: The Embattled Future of Passenger Rail Service. White River Junction, Vermont: Chelsea Green Publishing. ISBN 978-1-60358-064-9. Morgan, David P. (2015). "Two-Story Streamliners". In McGonigal, Robert S. (ed.). More trains of the 1950s. Waukesha, Wisconsin: Kalmbach Publishing. pp. 86–94. ISBN 978-1-62700-322-3. Reed, Robert C. (1975). The Streamline Era. San Marino, California: Golden West Books. ISBN 0-87095-053-3. Schafer, Mike; Welsh, Joe (1997). Classic American Streamliners. Osceola, Wisconsin: MotorBooks International. ISBN 978-0-7603-0377-1. Scribbins, Jim (2008) . The 400 Story. Minneapolis, Minnesota: University of Minnesota Press. ISBN 978-0-8166-5449-9. Thoms, William E. (1973). Reprieve for the Iron Horse: The AMTRAK Experiment–Its Predecessors and Prospects. Baton Rouge, Louisiana: Claitor's Publishing Division. OCLC 1094744. Wayner, Robert J., ed. (1972). Car Names, Numbers and Consists. New York: Wayner Publications. OCLC 8848690. Wayner, Robert J., ed. (1973). Amtrak Car Spotter (2nd ed.). New York: Wayner Publications. OCLC 1113513. Wegman, Mark (2008). American Passenger Trains and Locomotives Illustrated. Minneapolis, Minnesota: Voyageur Press. ISBN 978-0-7603-3475-1. Welsh, Joe (February 1999). "Showtime on the Coast Starlight". Trains. 58 (2): 50–60. ISSN 0041-0934. Yenne, Bill (2005). Santa Fe Chiefs. Saint Paul, Minnesota: MBI. ISBN 978-0-7603-1848-5. Zimmermann, Karl (2004). All Aboard! Passenger Trains Around the World. Honesdale, Pennsylvania: Boyds Mills Press. ISBN 978-1-59078-325-2. Zimmermann, Karl (Winter 2016). "Riding High: Santa Fe's Big Move of 1956". Classic Trains. 17 (4): 50–57. ISSN 1527-0718. Wikimedia Commons has media related to Hi-Level passenger cars. This page was last edited on 21 March 2019, at 17:26 (UTC).